We were inspired to connect people over the world in a more physical way than what the internet normally provides for us. We wanted to build a virtual reality in which all the people in our reality could see each other and interact with each other- potentially from across the globe. We built a dueling game in Unity in which two players may join the same game over the internet and duel in virtual reality. Using the Kinect allowed us to render virtual bodies of both players in the game, which both of the players can see. The players can fire shots at each other in a friendly duel by touching their left or right elbow with the opposite hand. All in all, we combined functionality of the Kinect with the Samsung Gear in order to create a prototype of a truly immersive VR experience. We developed our game in Unity. We used Unity-Kinect plugins to gather data from the connect in the Unity framework. The Kinect sends data to the computer, which reads in each vertex of the Kinect's representation of the player's body. These vectors are transferred to the Samsung phone via Open Sound Control. 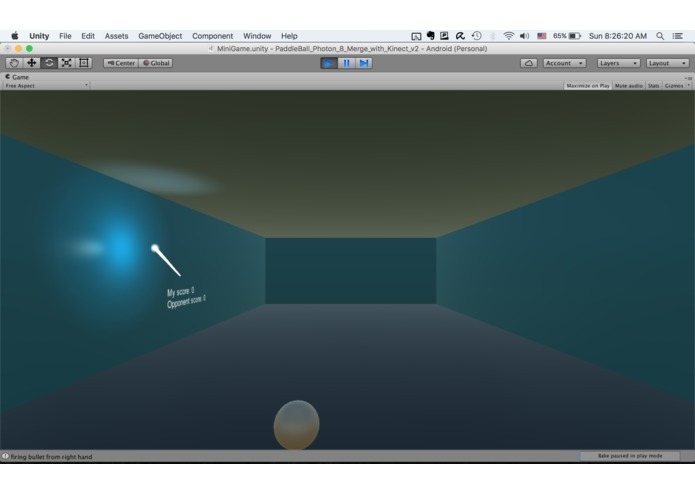 The phone then creates an avatar for the player in game, with the camera centered on the player's head. The Samsung Gear controls the direction of the camera. 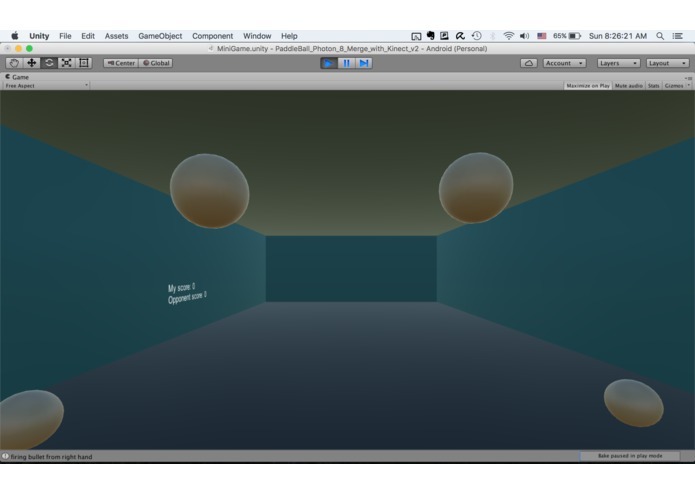 We used the Photon plugin for Unity to create online multiplayer functionality in our game. We ran into trouble using the Samsung Gear to control the camera as the Gear seems to initialize the camera direction based on the it's position at the moment the app starts. This meant that the Kinect and the Gear's ideas of the player's orientation were not always the same. We are very proud of our integration of VR and Kinect; specifically, getting both Open Sound Control and Photon to integrate with Unity in order to transfer information between the Kinect, the computer, and the Gear. It was important to us that the Gear and Computer communicate locally over the local Wifi network, but that the Gear could also connect with other Gears anywhere in the world, and we succeeded in implementing these goals. We definitely learned about connecting devices with Open Sound Control, and about creating multiplayer Unity games with Photon. None of us had worked on the Kinect or any VR devices prior to the Hackathon, so we had a lot of fun learning about the capabilities of these devices. We want to add GUI's to better facilitate connections between more than two people connecting with players of their choice. If we can aquire Gear's to continue working on, we would love to continue working on improving our game. It's already a lot of fun to play; imagine how it will look after we get some sleep! 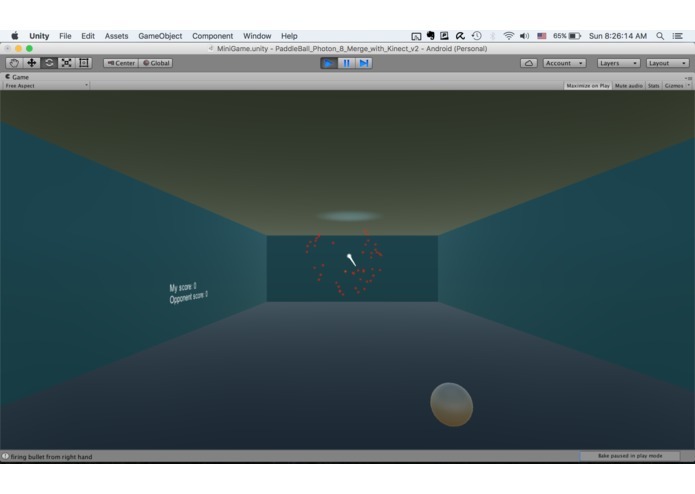 I worked on getting the kinks out of Open Sound Control, parts of the Photon multiplayer engine, and designing and implementing an intuitive gesture for firing shots. I was also an excellent body double for debugging with the Kinect. I worked on the protocol (Open Sound Control) that allowed the Kinect to "talk" to the VR headset, as well as a bunch of other little things like the player model, the bullet model, and the attachment of the camera to the head (which is harder than it sounds).